Yesterday's reading was about bringing things into form and The Empress looks as though this is exactly what she's doing. She's waiting patiently. Completely in tune with the cycles of nature, she understands that things happen in their own time and can't be rushed. If you are waiting to bring something to fruition, you would do well to remember this too - when you've done the work, trust in the process (even if you can't see what's going on 'within'). In the meantime, appreciate what you already have. Until I saw this card and did a little research, I didn't know that some orange trees can have blossom and fruit at the same time. It's an interesting metaphor and a reminder not to overlook the abundance you already have while you wait for new things to gestate or mature. 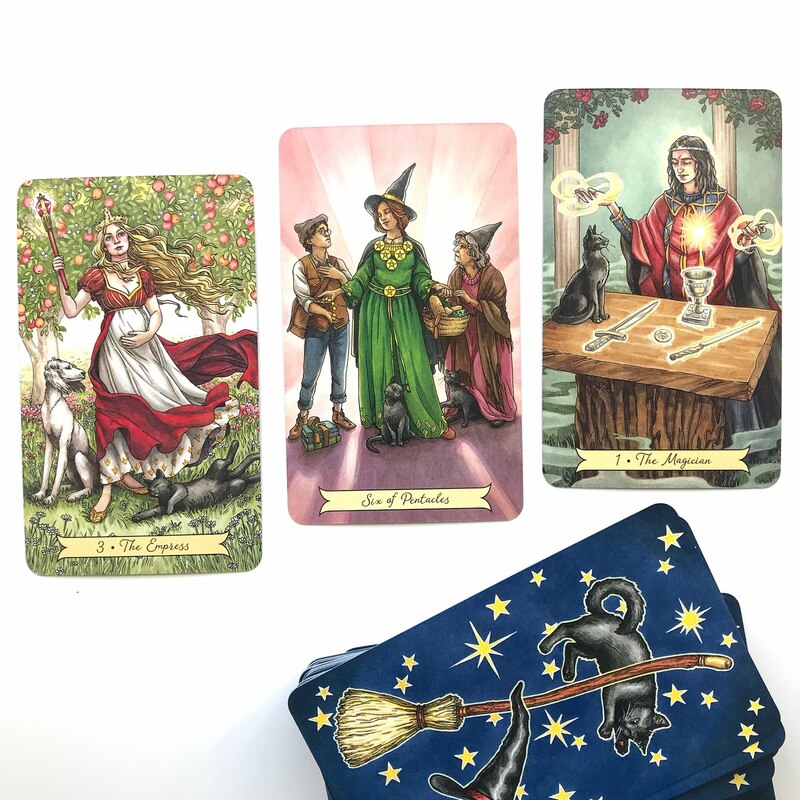 Abundance is something the Six of Pentacles addresses too - the witch appears to be sharing her 'wealth' with others. You may be wondering what giving things away has to go with manifesting your own desires, but the two are directly linked. Known as the Law of Giving and Receiving, the universe is understood by many to operate through dynamic exchange. Giving and receiving are different aspects of this universal flow and our willingness to give makes the abundance in our life circulate. It is succinctly summarised in this quote from Dr Dragos Bratasanu. The more you share unconditionally what others most need, the more you will receive what you most want. Which brings us, finally, to the final stage of manifestation with The Magician. Look at the energies 'circulating' all around. The Magician can create anything with ease and you can see that the real power comes from combining head, heart and hands - thoughtfulness, love, and action combined. So how does this relate to you? What are you working to bring into form? How can you share what you already have (this isn't necessarily a tangible item - it might be your time, your wisdom, etc) and appreciate your current abundance while you wait? What can you give in order to benefit from the dynamic exchange of the universe?